You will love this incredible home located near the 31 mile marker just West of Camdenton. 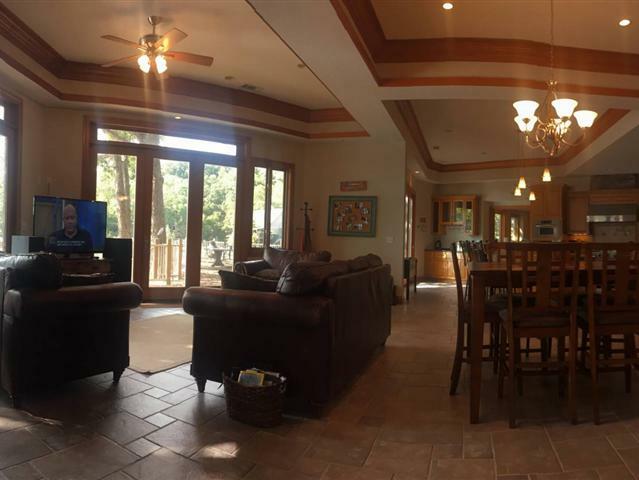 This six bedroom, four and a half bath, 4500 square foot home is nestled in a cove just past the Niangua bridge about 20 minutes from Osage Beach. Features include a master suite with a private deck, large walk-in shower, king bed and wet bar located on the upper level along with the laundry and garage. A half level down you will find three guest bedrooms, each with a queen bed, a full bathroom and a half bath. Continuing to the lower level, features include an additional master suite with a private bath located just off living and dining area. The Chef's kitchen includes a Viking gas stove, stainless steel appliances and plenty of counter space to make a great meal for the entire family. The dining area and breakfast bar has seating for 10-12 guests. Just off the kitchen and dining area is the large bunk & game room.